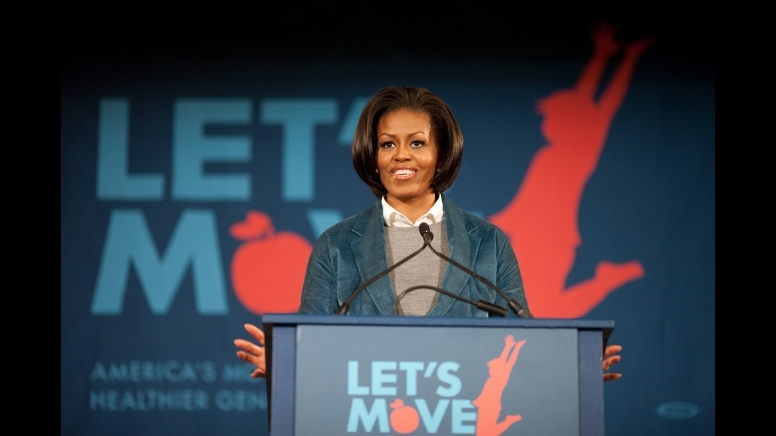 On Tuesday Michelle Obama is going to appear on the Biggest Loser as part of her Let’s Move! campaign. This comes after she has spent the last 2 years as the First Lady of the United States continuing to add to the ever growing amount of fat stigma in our society. Bringing up the problematic portions of her campaign normally ends with most people saying that she still has good intentions. Most people, even when they are causing harm, have good intentions but acknowledging the portions of the campaign that cause more harm then good is not ignoring the positive aspects. The problem with the Let’s Move! campaign has far more do with the way that it is framed and the reality of where it came from. The announcement of the Let’s Move! campaign coincided with a report from retired military leaders titled “Too Fat to Fight,” which called on schools to remove junk food from their cafeterias because once children were becoming old enough to enlist in the military 40% of them did not fit into the BMI standard set by the military. FLOTUS’s relationship with the military has been extensive during her time with the campaign. She has spoken about how fat bodies are a national security risk continuing the link between body size and lower acceptance into the military. This has continued to happen without even acknowledging that the very BMI standards that the military uses increases the risk of service members of having or developing eating disorders Some say they are three times as likely as the general population to develop an eating disorder. She has also visited Fort Jackson military base in South Carolina to promote the campaign. While her campaign continues to work towards creating access to fresh foods and getting children moving in their bodies, she is also speaking out nationally about how she plans to stop childhood ‘obesity’ in a generation, that fat people are more likely to be bad employees or need extra sick time, and has continued this with her support of the program the Biggest Loser. The reality is that this isn’t a show that is trying to make people healthy; their primary goal is to make people thin by using some pretty horrific tactics. She might have good intentions in creating a better society to live in but in reality her efforts will always fall short if she continues to frame it around the idea that fat bodies are inherently unhealthy while also not acknowledging that we don’t know how to make people lose weight long term. Looking past all of these issues by believing that her intentions are good doesn’t mean that the harm she causes is invalid or that they don’t matter. Harm is still harm it still changes lives. This entry was posted in Fat Rights and tagged body politics, childhood obesity, fat, fat acceptance, fat rights, good intentions, health, lets move, lets move campaign, michelle obama, obesity, politics, society by fatbodypolitics. Bookmark the permalink. I have said over and over that the road to he’ll is paved with good intentions, and as such, I don’t even WANT to know where the road paved with BAD ones takes you! FLOTUS might have the very best of intentions, but that doesn’t mean the whole thing isn’t tragically flawed. It puts too much emphasis on one half and not enough on the other. As in people automatically think the campaign is and should be only about annihilating fat people, instead of involving people of all shapes, sizes, ages, and levels of fitness. I know first hand about the whole military thing. My husband is active duty and early in his military career he was told by his squadron that he was overweight. Here’s the crazy part, this was when his height and weight was exactly the same as that year’s Super Bowl winning Quarter Back. Yep, the fact that he’s just a big ol’ Oklahoma boy didn’t work for them. I actually knew a guy who fooled the tests when he was active duty by using one of those machines that only work out your neck because all the Navy did was measure your neck and your waist. So, he just made his neck bigger and that was acceptable. It’s all a complete and utter crock. Oh, and by the way, my husband is still struggling. We’ve hired a running coach so that he can get the most out of his run time to offset his body measurement score. It’s all a big steaming pile of BS and I’m tired of it.